This unassuming little book has been catching my eye everywhere I’ve been for the last few months—the grocery store, airport, bookstores, and online—so I finally decided to take the plunge and pick it up. And I am thrilled that I did! 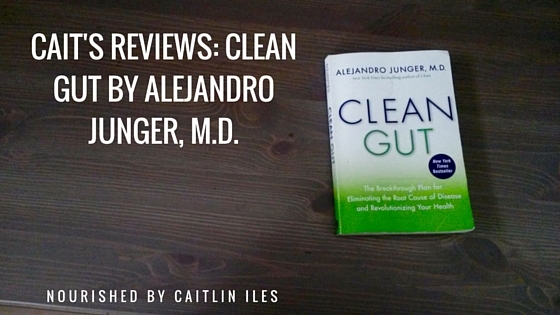 Most of you know how much I love talking probiotics and gut health so it should come as no surprise that I can’t resist a book that gets to what I believe to be the root cause of all health or disease: The integrity and health of our digestive systems. This book is great for both the technical nutritionist or wellness practitioner as it contains lots of scientific evidence and supplementation suggestions, but it’s also written in such a way as to be approachable for those who don’t have an official education nutrition and health. Junger states right off the bat that you can never really have lasting health without looking after your gut and keeping it clean and healthy. Just as the secret to a lush garden starts in the plants’ roots, the body’s health begins in the gut, its own internal roots. The gut is the center of health, illness, and dysfunction. One of my favourite chapters was entitled “The Gut: Your Second Brain” and went into a lot of excellent detail about how the brain and gut are intimately connected, what neurotransmitters are produced in our digestive system (hint: we need them in order to stay happy! ), and how, exactly, this mysterious tube works to turn an apple into the various cells throughout our body. It’s a great primer on the how of digestive health on a very practical level. One of the best takeaways is his description of our digestive immune system, the Gut-Associated Lymphatic Tissue (GALT) and it’s key role in maintaining a body free from inflammation and disease. Another important chapter, “Survival Disguised as Disease” explains how many chronic illnesses such as heart disease, autoimmune conditions, cancer, depression, allergies, back pain, infertility, and food sensitivities have at their root cause gut dysfunction that leads to chronic inflammation, which then manifests as various illnesses. It’s a fascinating and quick little primer on the mechanisms underlying many of the most common diseases that are crushing our health care system under their combined weight and seeming inability to be effectively treated or eliminated. If you suffer from any of these issues, it is absolutely worth picking up this book to see if chronic gut dysfunction could be one of the contributing factors. Finally, after outlining why gut health is so important, Junger provides a step-by-step guide to help heal our issues, which uses the Four Rs of digestive healing: Remove, Replace, Reinoculate, and Repair. He also provides clear dietary and supplementation guidelines that should work for most of the general population, but does advise stronger supplements if your parasite/yeast/bacteria overgrowth is more severe. I have been following the protocol myself and have seen definite benefits! All in all, Junger does a great job of breaking down how most disease has it’s root cause in gut dysfunction using clear and concise language. He wraps up in about 150 pages and includes a ton of delicious and Clean Gut Diet approved recipes at the end of the book. If you’re interested in digestive health, this is a handy little book to have on hand. Two thumbs up from this kid!